Facebook Messenger is one of the most popular amongst messaging apps. The Messenger is also one of the most successful product of the social media giant Facebook. As you probably know that the Messenger is full of many extra features which hardy used by most users. The current Facebook Messenger has many unwanted messy features like Games, News, Bots and many more. Thats why Facebook introduced a lite version of the app which is Messenger Lite. A fast and data-efficient messaging app to reach the people in your life. 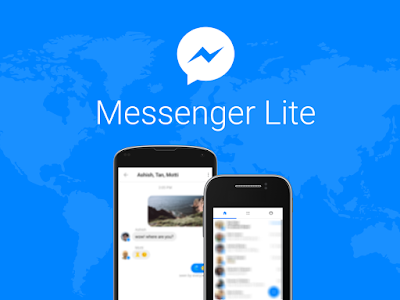 The Messenger Lite is only 10MB in size, download and install quickly. Run efficiently everywhere even where Internet connections are slow and unstable, uses less mobile data. The app runs on almost all versions of android phones. Those who are interested, the Facebook already started rolling out the new improved Facebook Messenger 4. All the supported devices will get the update very soon. Also Check: Facebook Messenger 4: A Better Version than previous? - Message people one to one or in groups to catch up or make plans. - Send photos or links, or express yourself with stickers. Make one-to-one voice and video calls for free over Wi-Fi (otherwise standard data charges apply). Talk for as long as you want, even with people in other countries.